This weekend I drove teenagers to the movies (my daughter has her learner’s permit but not her driver’s license so for now I’m still the chauffer). They saw Escape Room, and I went next door to see Aquaman, figuring in the sea glass world we will be chatting about it. Also I’ll admit to thinking this tatted-up guy doesn’t look terrible in movie trailers. It escaped me in the hype about the film that Nicole Kidman was in it, so the first thing that happens is I’m wondering where I’ve seen this actress before, she looks familiar. It dawns on me that holy crap, that’s Nicole Kidman, only she’s had so much plastic surgery that I didn’t even recognize her, what the hell. What a difficult job it must be to try to act when you can’t move your face in any way. New Oscar category needed: Achievement in Acting Without Facial Expression. Not that she’d win- her costumes are gorgeous, and her body double did a fantastic job with the ninja scenes, but she leaves her child and can’t even manage to seem sad. Then there’s Amber Heard as Mera the mermaid-with-feet, green scales and shockingly red hair, as though she just left a last-minute Ariel cosplay event/had to order the wig from Amazon and pay extra for one-day shipping. She levels up costume-wise in the oddly-Johnny Cash named “Ring of Fire” event scene where she dons an adorbs live jellyfish gown. The chemistry between her and fish boy- sorry, he corrects that to fish man, is not convincing at all. The film’s only believable romantic character is his lighthouse keeper dad, who returns to the sea looking for his lost love despite her facial-emotion limitations during the long-ago departure. Oscar performances aren’t what people are coming to see, anyway, and Jason Momoa as Aquaman doesn’t disappoint that lack of expectations. He started out on what? Baywatch Hawaii? So combine that with his Game of Thrones gig and pretty much Aquaman and his over-the-shoulder smolder is where we end up. He’s Merman Magic Mike without the dancing. A bad script could be blamed instead of the actors for some of this. The film’s visual effects are impressive, particularly a villainous sea creature battle, but how is even Momoa supposed to deal with a line, when a drop of water is brought forth in a crucial scene by the not-mermaid, in which he smirks “I could have just peed on it?” SMH. The Forbes review of Aquaman points out that the “evil” king half-brother of smolderboy “justifies this by pointing out that we are wrecking his marine home by polluting and overfishing it, so he wants to wipe us out before we can do any more harm. We might not like his methods, but there’s no denying that he’s got a point.” He does! 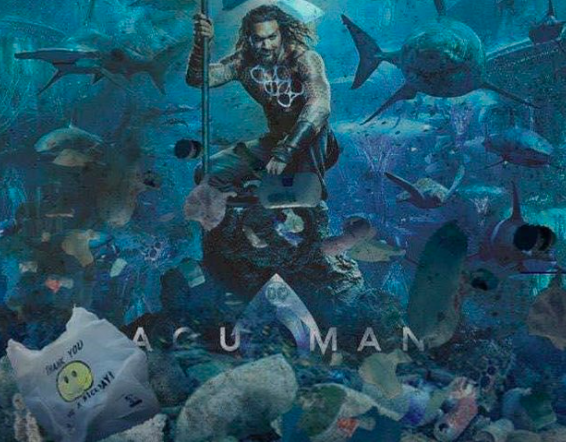 Shame he’s essentially punished for fighting against ocean pollution. Granted scourging the surface seems extreme, but honestly the way we treat the ocean, can’t say I don’t feel his pain a lot of the time. Anyone who’s ever done a beach cleanup and sees this movie has to be nodding their head during the scene where all the marine debris is choking the marine life to death. But alas, the Botoxed Queen of Atlantis shows up at the end to convince her wayward bickering sons to carry on, blah blah the land and the sea are one, off goes pollution-fighting king to prison and in the end, spoiler alert, Baywatch Hawaii wins. 6-pack abs 1, 6-pack plastic soda ring floating in the ocean, 0. Thanks for reading! Follow me on Instagram, Facebook, Twitter or YouTube, or check out my shop The Healing Beach!